Nightcaster II: Equinox combines spell and melee combat as the husband-and-wife team of Arran and Madelyn use tactical skills and practical magic to battle goblins, trolls, dragons and other demons in a lush, 3D fantasy world. Other games developed by Jaleco Ltd. In Goblin Commander: Unleash The Horde, players battle their way through the war-torn land of Ogriss, a world ruled by goblins. 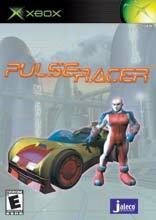 Spawned by the mighty wizard Fraziel, the goblins have fallen under a corrupt influence that now threatens the balance of ..
Pulse Racer is set in a dazzling future where players careen towards the clouds in sleek vehicles, using high-tech tools and their own life force, to gain an advantage over the competition. Racers push their skills and bodies to the limit. Linked..
More Games from Jaleco Ltd. In summer 2003, Walt Disney Pictures and Pixar Animation will present the theatrical release of Finding Nemo. The film follows the undersea journey of a clownfish named Marlin as he searches for his m..